Trek Bicycle Corporation is a major multinational bicycle manufacture based in Waterloo, Wisconsin. Up until recently, different divisions used varying software programs and communication styles to perform its project management. This lead to constant delays in getting new products to market as well as missed sales due to stocking out at key times. When Kris Lamp took on the newly created position of program manager, she initiated a search for a unified project management software suite. There was a clear organizational need for a product that would allow for seamless communication amongst divisions around the globe. The company chose AtTask (which in early 2015 rebranded as Workfront) as their Enterprise PMIS solution. Under Lamp’s guidance, the implementation was kept simple. They opted for a software-as-a-service (SaaS) model, which transferred the support risks onto the vendor. Also, the company opted for minimal customization to the PMIS and chose to implement the rollout to one group at a time. This slow start allowed for the project team to work out any issues as they came up and before larger scale implementations. This mitigated the risk of project failure by starting simple and allowing time in the schedule for early rework. Trek and the PMIS project management team heavily relied on management buy-in to help with employee adoption of the new system. Because the PMIS was eventually rolled out company-wide in many different countries, the project management team utilized local managers to encourage and/or mandate employees to adopt the new PMIS. In return, the PMIS project team kept manager notified of changes far in advance and conveyed why and how the changes would happen. The overall consensus from employees was that the PMIS not only helped with daily work, but also helped them feel more connected with the company’s work. The PMIS implementation was almost immediately considered a success. End-user buy-in was high and due to their slow but steady implementation, they were able to begin to introduce customization. On-time delivery rates improved 20 percent, which directly benefited the bottom line. A few years after implementation, 800 projects were being managed using the PMIS. These projects were being managed much more smoothly than far fewer projects the company had prior to the implementation. Lamp credits the PMIS’s implementation success to decisions made early on by the project team. Choosing a vendor that had an off-the-shelf product that fit most of their needs and was able to provide support alleviated much of the early risk of failure. By using a slow and careful implementation, group by group, change requests were minimal and easy to handle. Most importantly, the team was sure to provide ample advanced communication to managers about the software. This allowed managers to educate employees on why the change was happening and why it was so important to the company. Overall, the PMIS took Trek’s project management from an ineffective and redundant process that frequently went over schedule and budget, to a transparent and seamless linking of divisions. Does your company utilize a PM software suite? If so, which product do they use and what is your opinion of it? Overby, S. (2014) Trek Bicycle Rides Project Management Tool to Efficiency. CIO Magazine, retrieved 7/23/15 from http://www.cio.com/article/2377427/project-management/trek-bicycle-rides-project-management-tool-to-efficiency.html. According to the Project Management Institute website, the PMI Agile Certified Practitioner (PMI-ACP) is their fastest growing certification. According to our textbook, “The key point is that traditional PM techniques were developed to operate in the predictable zone where the scope of the project is fairly well defined and technology to be used is established. Agile lives in the unpredictable zone.” (Larson and Gray 584). Key differentiators of Agile include; continuous design, flexible scope, high uncertainty, and self-organizing teams engaged in high customer interaction. Where requirements will change drastically during the lifecycle. The customer does not provide the specifics of what they want up front, but has a loose idea instead. I spoke with a coworker, an experienced Product Manager, who feels that Agile is great in concept, but harder in implementation, especially in large organizations. The Agile model thrives on simplicity, which may be difficult to achieve in a big firm. Our employer is global, so a geographically distributed Engineering and Marketing group makes face-to-face meetings more difficult and prolongs the quick iterations that Agile strives for. Although, technology is helping to bridge the gaps. Another topic of discussion surrounded total buy-in at the enterprise level. Agile is not something to dip your toes in. Success is realized and repeated through dedicated Agile teams. The Agile model does not necessarily align with a matrix team environment and may end up defeating the purpose due to a lack of team cohesion. What are your thoughts on Agile Project Management? Good, bad, indifferent? Feel free to share any personal experiences surrounding Agile, a shift away from Traditional PM or a hybrid approach. Is it realistic to introduce Agile on a team-by-team basis? Do you see any roadblocks? Larson, Erik W. and Gray, Clifford F. (2011). Project Management: The Managerial Process. New York, NY: McGraw-Hill Irwin. In 2000 my family contacted a builder in order to build a home. After approximately ten months my family and I were happy to receive a two story home. This translates to approximately one story built every five months. Although this may seem common in the USA, a province in China called Dongting Lake was able to produce a 30 story building in 15 days. This feat was accomplished through a proper management plan and efficient execution. Although the building may have been built in 15 days the project was mapped and planned out long before. Project managers effectively developed an organized strategy, defined the project, estimated project times and costs, developed a project plan, and executed the plan. The project managers involved in this undertaking understood the organization’s strategy and were able to align the projects with the firm’s mission. These managers needed to respond to various environmental factors as well as navigating resource scarcities. Managers could possibly use the SMART pneumonic to remember to be specific in targeting objectives, establish measurable progress checks, make sure the objective is assignable to specific individuals, develop a realistic idea of what can be done with the given resources, and understand the time duration to achieve the objective. 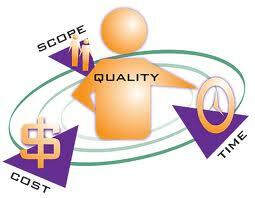 This step is crucial in project management in order to lay the foundation of the entire project. Managers properly defined the project, established priorities, and created an effective work breakdown structure. As you can see in the video, components of the building were developed off-site and were assembled on the land afterwards. This focused the project by created a plan, schedule, and budget that is able to be effectively managed at the respective organizational levels. Many times projects may be properly defined and aligned with the organization’s strategy but when it comes to estimating the projects there may be a difference of opinions. Top-down estimates are generally made from top managers who have limited knowledge on process where as bottom-up approach is generally derived from individuals who have a great deal of knowledge of the process and can provide a check on various costs in the work breakdown structure. In my organization, we do not utilize the bottom up approach very often. When making decisions about work processes without fully understanding the work process seems to create inefficiencies in the organization. I think that process individuals should be included in the estimation as well as the development of the project plan. These individuals would be able to identify critical activities as well as provide a basis for scheduling other activities. This plan can then be managed by top management. With a proper plan, management can effectively manage various activities and deliver the project. Execution is key to any project, especially when constructing a building. Some individuals may be worried about entering a building which was built in fifteen days, however when understanding the planning and management involved and witnessing the execution I would not be worried, would you? Does your doctor use an iPad, tablet, laptop, or computer at any point during your check up? I for one have experienced several doctors utilizing technology during a doctor’s appointment, paying more attention to the technology than my medical concerns. Information technology is being implemented across the medical industry. Paper has become a nonentity, and more doctors are straying away from the old fashioned version of record keeping. Digitalizing records, and utilizing electronic health records to supervise patients’ medical histories is becoming the new norm. However, productivity will decline if this new technology is not executed correctly. When EHRs are applied, they can create subtle changes within the practice, thus ultimately changing the way the operation functions. The “communication patterns” of the staff become incompatible, and doctors, nurses, and clinical staff are finding themselves spending more time working on the systems than with patients. This in turn, is extending their workday, they now have to do more work, and they may lose business from disgruntled patients. EHRs were originally put into operation to promote efficiency and make patient care safer. EHRs allow for “patient data to be shared relatively easily between providers within a given practice” and eliminate the possibility of penmanship errors. The best part about EHRs is that they can immediately detect errors that are made, which makes this type of record-keeping effective and beneficial to the medical field. Higher levels of production in some medical institutions have seen high productivity; these institutions utilized more EHR usage and increased delegation. Larger medical facilities now hire an EHR staff and that staff becomes responsible for maintaining the data, entering the data, and also helping all other staff with EHRs. The article hypothesizes that smaller medical institutions are more face-to-face oriented, and focus on establishing a doctor-patient relationship through communication. Additionally, some smaller medical institutions do not have the means to pay for an increase in their EHR systems or an EHR staff to promote delegation within the office. Why do you think that productivity declines for some institutions? Do you feel that these new information technology systems are beneficial? Or are they creating a rift in your doctor-patient relationship? As the demand for any product grows, a corporate powerhouse with efficient standardized processes seems to rise with it. Yoga, which began as an art for the spiritual or inward looking, has been no exception. 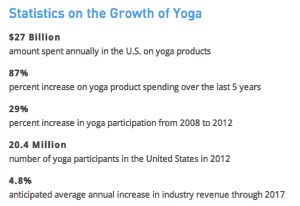 Look at these numbers that show the growth of yoga in recent years (reported by Emily Ritter of ChannelSignal.com early this year). 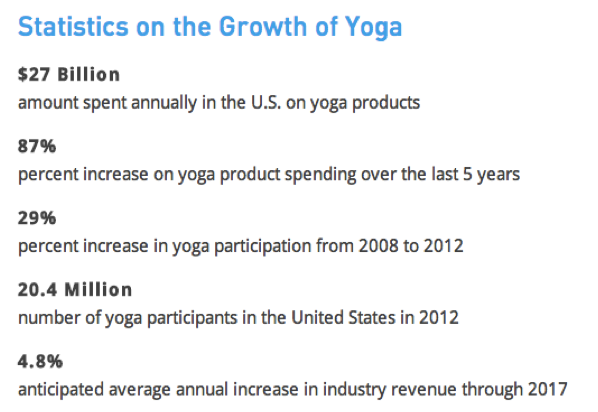 CorePower Yoga has capitalized on this growing trend. 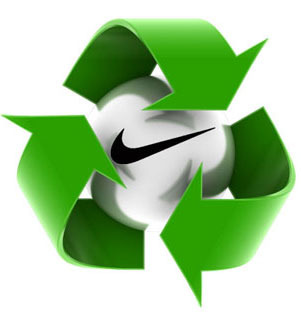 They have “corporatized” what was initially more of an art so people can accomplish a full workout in one yoga session. All classes include an abdominal workout section, many are heated so you can break a sweat, there are class options with weights, etc. The idea is you can do a 1-hour yoga workout that will cover cardio, strengthening, flexibility and finding your inner chi. I have dabbled with yoga throughout the last few years to gain an advantage as a basketball player. The typical workouts basketball teams do are lifting, running and basketball practice, all mostly restricting flexibility. Yoga is unique in it focuses on increasing this very valuable flexibility. CorePower also adds weights and an abdominal section to many classes – even more benefits for an athlete like myself. Great, right? I wasn’t a fan. The best yoga class session I ever had was one-on-one session in the heart of my workday with a really weird dude, Chad. I walked into what was supposed to be a group class session at Cat Financial to see I was the only employee who showed up. We began with a few simple poses so Chad could assess my flexibility and strength. What followed was a plethora of poses tailored specifically for me. Chad encouraged me to try new things or stay where I was based on how I feel. He talked me through the origins and purposes of different parts of the practice. There was no music and no heat like CorePower. Chad didn’t care if I stayed on my mat or followed exactly what he was saying. By the end of the session, I was flowing through my own combination of poses focusing inward. When I went back to work I felt refreshed, not just physically, but mentally too. Yoga with Chad was personalized, creative, an art, and the best yoga experience I’ve had. CorePower Yoga created efficient standard operations to allow the optimal large-scale production, and this is usually viewed as a positive, but maybe it’s not always better. I learned through yoga that variability and personalization, even if inefficient on a large scale, could be preferred. Chad only had one student in his class because most people seeking out yoga will be led to a CorePower, not a freelance instructor. Maybe they would be better off if there was not a corporate in the way of them finding an artist. My questions: Is large-scale operational efficiency brought by corporate powerhouses always a benefit to society? If not, where are other markets you see it as a disadvantage? The terms “efficiency” and “productivity” have always been referred to positively; as efficiency in process rises, productivity rises.” Thinking this through, we define efficiency as the better use of resources, the decrease in human labor per product, and the increase in output from freed – up labor, which ultimately should result in an increase in wages. In essence, to increase productivity, efficiency has to increase; and efficiency is synonymous with less cost and more revenue. Revenue is then used to reward workers for their high productivity. It is here that the robot-human conflict comes in. It does not take a seer to foretell the replacement of low-skill human laborers by robots. The Economist outlines that, in a correct system, as technology replaces human workers; the higher skilled workers make more money and spend more money, creating new jobs (Technology isn’t working, p. 6). However, it is no stretch of the imagination that businesses are reluctant to increase the wages of their employees, and this issue is the problem. Average human productivity increased last year at a rate of 2.5%, while wage increase lagged at 1%. This shows that, as output increased, people earned marginally less than what would have been normal. Without increased wages, people cannot spend, and without spending, there is no new creation of jobs. Furthermore, we know that robots do not require payment for their services. And as we saw on Monday, their accuracy and precision removes the problem of human error, making them the epitome of efficiency. These facts make them a more viable solution to increasing output. As the Economist observes, COOs and managers see that robots can dramatically increase a firm’s output without having to receive payment, and so they invest in more robots (6). This results in less need for human labor, which leaves many unemployed, which ultimately leads to less sales and more inventory. As time moves forward, technology will continue to improve. We saw this with video cassettes to DVDs to online streaming and the ipod series, and now we are seeing the workforce demography change as well. I feel that businesses have to find a balance between robot and human workers in order to maintain cash flows. I find it interesting that something so helpful in the workforce could lead to such problems, and it merits discussion. How do you feel about robots entering the workforce? Do you really think it will be all that bad? How do you think low-skill laborers will make a living if their jobs are occupied by technology that does not need money to survive? “The Third Great Wave.” Economist 4 Oct. 2014: 56, 58. Print. In an interesting article that I have read called “ why does project management fail?”, the author tries to bring his own experience and theories into play. He starts talking about how many companies question themselves and that they think that project management is just just a mixture of tools and techniques that should guarantee their success. As we learned in class, project management consists of two parts, the first one is dependent on science which are tools and techniques. The second is that its also an art, it is important to put in our mind that even with the best planing techniques possible, even if we put a contingency for every event, things still go wrong. It is in the art of project management that we learn how to adapt and move on to make something work. The author goes on explaining that there are some factors which lead to the failure of project management in organisations such as the” Lack of knowledge, lack of organisational policy, lack of enforcement of policy and procedures, lack of consideration for the magnitude and complexities of project management”. It is true that project management tools are only as good as the people who use them and it is a philosophy that would work only if everyone in the organisation or at least the specific project is onboard. Some times it is better to outsource, if a certain company doesn’t have enough knowledge/resources and doesn’t feel it has the discipline to adopt project management methodology. There are some companies whom specialize in consultancy and project management, in fact outsourcing could save those companies a lot of money and energy as well as add proficiency. It is also important to look at the role of the project manager himself, we spoke in class about Active and reactive managers. I think that the article focuses on the benefits of active managers and dismisses reactive managers. It is true that being active means that you should be ready for different scenarios and prepare all contingencies in advance, but that is the science part. Reactive management is more like the art part where you would have to work with whats introit of you. A balance of the two is always needed, you don’t want to start a project without any plan, in the same same time you don’t want someone whom wouldn’t know how to respond when something goes wrong and he had no way of putting a contingency plan for it. Some think that project failure is only due to not being able to deliver to costs or expected quality or even missing the deadline. Those are all valid reasons, but leadership and organisation philosophy is what could be put as the thin line between project success and project failure. Managers are bringing the project down. The start of a project is a critical time; a lot of focus is put on budgets, scheduling and risk. One often overlooked aspect of project is the role the project manager plays. There are many tools that can help in predicting costs, timing and potential risks of the project. However, there are few tools to help decide on the project manager other than a ‘gut feel’, or stating ‘I have my best man on the job’. The way the project manager, manages the project can have a huge impact on the success of the project. A project manager needs to be able to clearly define milestones and convey these milestones to the project team. A project schedule and budget often relies on the belief that the team will be efficient throughout the project. A team without clearly defined goals or confusion within the team will not work to their full efficiency. In my own experience weeks have been “lost” during a project due to team members working on the wrong tasks or working on tasks that do not help the project move forward efficiently. Without definition and effective communication all the tools and analysis may not ensure sure the project is a success. Another important aspect to a successful project is the ability to be able to adjust plans in an effective and timely fashion. This responsibility of decision making often falls onto the project manager. A project manager that gets bogged down in making decisions can affect the entire project. The time that it takes to make a decision can affect the schedule; also an improper decision can affect the possibility for a successful project. Also, during a project a project manager needs to be aware of any changes from the original plan to help the project move quickly and efficiently. Therefore a project manager that can make critical decisions in a timely fashion increases the chance of a successful project, and can assure the team that the project is well managed and help the project move forward. A British study estimated that for approximately every 1.5 billion dollars spent on projects, approximately 235 million dollars were at risk due to inadequate project management. I have seen many instances in my career where the project manager and not the project nature, schedule or budget have had the largest impact on a project. Many times how the project is conducted and the communication in the project that is most beneficial and often this can be seen by number of successful projects a certain project manager has managed. These management styles are very hard to be measured often times it is overlooked and not addressed. How important do you feel the actual project manager has in the overall success in the project? It is at least a starting point that the Government Accountability Office (GAO) is starting to assess different government agencies against project management best practices (as defined by the Project Management Institute, or PMI). It is interesting that they are starting with the Department of Housing and Urban Development (HUD). On one hand, it makes sense since they deal with physical properties and construction, which lend itself better to traditional project management. On the other hand, it may not be the most effective place to start in the government (healthcare would have a bigger impact, for instance). The six categories HUD was assessed within were: (1) project charter, (2) work breakdown structure, (3) project management plan, (4) requirements management plan, (5) requirements traceability matrix, and (6) acquisition strategy. Interestingly, most projects had charters, but not clear accountability (insert joke about government (in)efficiencies here). Potentially more concerning, is at least two projects under major initiatives lacked “development” in four of the six categories, which implies minimal/insufficient project management over the project. With the increasing pressure on the government (like the private industry) to do more with less, the historical inefficiencies will no longer be acceptable. One key way to deal with this is not to actually do less, but to be efficient by reducing overhead (i.e., project management). The fundamental advantage to project management (besides success) is planning ahead – which the government needs to do more of. Hopefully, the GAO will continue to assess various government agencies (AND follow-up to confirm changes are made) so that the use of taxpayer’s money is as efficient as the use of money within the private sector.